What else can you buy for the price of the 2019 Suzuki Intruder? Suzuki has launched the 2019 edition of the Intruder. This 150cc cruiser comes in two variants: a carburetted one priced at Rs 1,01,362 and a fuel-injected version priced at Rs 1,08,162 (both prices, ex-showroom Delhi). Yes, the price tag is a bit on the higher side for a 150cc motorcycle and there are a few options available for that kind of money. Here are some of our picks. For Rs 3,000 more than the fuel injected Intruder, you could opt for the more powerful Apache RTR 200 4V. It’s 197.75cc air and oil-cooled fuel injected motor makes 21PS and 18Nm of torque. While it gets a 5-speed gearbox, the RTR 200 is the most affordable bike to get a slipper clutch. Other features include a flyscreen, full digital instrument console with lap timer and a dual-channel ABS with rear lift off protection. 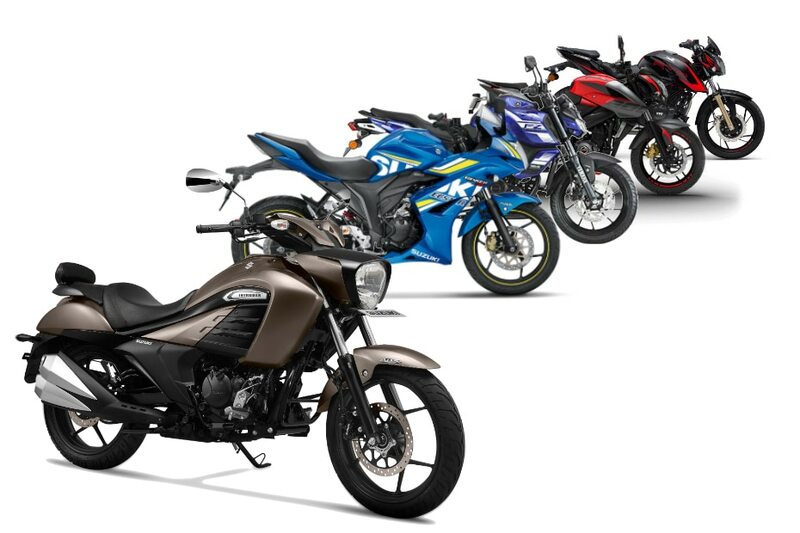 The RTR 200 is a good all-rounder if you are looking for a balance of performance and practicality. The NS200 might miss out on some of the features of the RTR 200 but it gets a 199.5cc liquid-cooled motor that puts out 23.5PS and 18.3Nm of torque. It also gets a 6-speed gearbox and a perimeter frame for better handling. The Pulsar NS200 feels sportier than the RTR and if you are willing to trade off plush ride quality for extra sportiness, the Pulsar NS 200 is a good bet. If you like faired bikes, the Gixxer SF is a good option. In fact, both the Intruder and Gixxer SF are based on the Gixxer platform and share a majority of the components, including the 154.9cc air-cooled and fuel injected motor. It makes 14.8PS and 14Nm of torque. Like the Intruder, the Gixxer SF gets single-channel ABS and a full digital instrument console. Surprisingly the Gixxer SF FI costs Rs 6,256 lesser than the Intruder 150 FI. This is another naked 150cc option that undercuts the Intruder price range. Along with a new, more aggressive bodywork inspired from the larger FZ25, it gets an updated instrument console and new features like an LED headlamp, a lower seat, a larger front disc brake and single-channel ABS. The FZ-S FI continues to be powered by the same 149cc air-cooled and fuel injected motor which makes 13.2PS and 12.8Nm of torque. The fact that it has recently been launched and the new bodywork makes the FZ-S look larger than most 150cc bikes adds to its appeal.